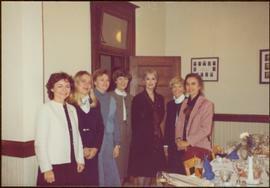 Campagnolo stands third from right.Handwritten annotation on verso reads: “founding Regina Women’s Network, Oct/82”. Campagnolo stands in centre. 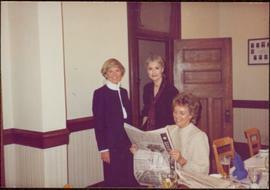 Woman in foreground sits reading a newspaper.Handwritten annotation on verso reads: “founding Regina Women’s Network, Oct/82”.